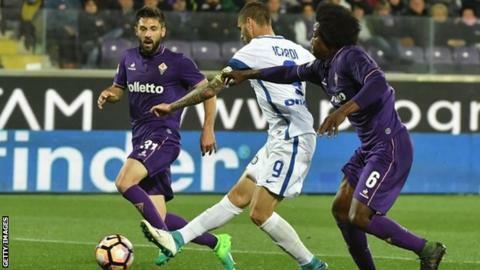 Inter Milan captain Mauro Icardi scored a hat-trick but his side lost to Fiorentina to dent their Europa League qualification hopes. Matias Vecino put the hosts head, before Ivan Perisic levelled and Icardi made it 2-1 at the break to Inter, who remain seventh - now only one point above their opponents. Federico Bernardeschi had a penalty saved for Fiorentina but Davide Astori levelled and they led 5-2 through a further goal from Vecino and a Khouma Babacar double. Icardi scored twice more in the last three minutes - becoming the first Inter player since Christian Vieri in 2001 to score a Serie A hat-trick away from home - but it was not enough. Match ends, Fiorentina 5, Inter Milan 4. Samir Handanovic (Inter Milan) is shown the yellow card. Second Half ends, Fiorentina 5, Inter Milan 4. Sebastián Cristóforo (Fiorentina) is shown the yellow card for a bad foul. Foul by Sebastián Cristóforo (Fiorentina). Marcelo Brozovic (Inter Milan) wins a free kick in the attacking half. Offside, Fiorentina. Ciprian Tatarusanu tries a through ball, but Khouma Babacar is caught offside. Hrvoje Milic (Fiorentina) wins a free kick in the defensive half. Foul by Roberto Gagliardini (Inter Milan). Corner, Inter Milan. Conceded by Matías Vecino. Goal! Fiorentina 5, Inter Milan 4. Mauro Icardi (Inter Milan) header from very close range to the centre of the goal. Assisted by Antonio Candreva with a cross following a corner. Corner, Inter Milan. Conceded by Hrvoje Milic. Goal! Fiorentina 5, Inter Milan 3. Mauro Icardi (Inter Milan) right footed shot from the centre of the box to the bottom left corner. Assisted by Ivan Perisic with a cross. Delay in match Gary Medel (Inter Milan) because of an injury. Corner, Fiorentina. Conceded by Miranda. Attempt blocked. Khouma Babacar (Fiorentina) right footed shot from outside the box is blocked. Assisted by Josip Ilicic. Substitution, Fiorentina. Sebastián Cristóforo replaces Cristian Tello. Attempt missed. João Mário (Inter Milan) right footed shot from outside the box is close, but misses the top left corner. Assisted by Éder. Goal! Fiorentina 5, Inter Milan 2. Khouma Babacar (Fiorentina) right footed shot from the centre of the box to the bottom right corner. Assisted by Carlos Salcedo. Carlos Sánchez (Fiorentina) is shown the yellow card for a bad foul. Foul by Carlos Sánchez (Fiorentina). Éder (Inter Milan) wins a free kick in the attacking half. Offside, Fiorentina. Carlos Salcedo tries a through ball, but Khouma Babacar is caught offside. Attempt blocked. Éder (Inter Milan) right footed shot from outside the box is blocked. Substitution, Inter Milan. Marcelo Brozovic replaces Geoffrey Kondogbia. Davide Astori (Fiorentina) is shown the yellow card for a bad foul. Foul by Davide Astori (Fiorentina). Substitution, Inter Milan. Éder replaces Yuto Nagatomo. Foul by Milan Badelj (Fiorentina). João Mário (Inter Milan) wins a free kick in the attacking half. Goal! Fiorentina 4, Inter Milan 2. Khouma Babacar (Fiorentina) right footed shot from the left side of the box to the bottom right corner. Assisted by Matías Vecino following a fast break. Offside, Inter Milan. Roberto Gagliardini tries a through ball, but Danilo D'Ambrosio is caught offside. Goal! Fiorentina 3, Inter Milan 2. Matías Vecino (Fiorentina) right footed shot from outside the box to the bottom left corner. Assisted by Borja Valero. Goal! Fiorentina 2, Inter Milan 2. Davide Astori (Fiorentina) header from the centre of the box to the bottom right corner. Assisted by Borja Valero with a cross following a corner. Corner, Fiorentina. Conceded by Samir Handanovic.